The Aerzener bread and cakes GmbH serves annually with 35 million pieces of cake sweet “mouths” and 120 million packets of bread consumed Aerzen customers to date. 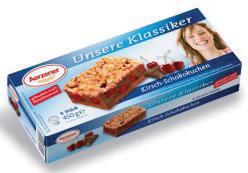 The core assortment frozen cake and wholemeal bread sells the Aerzen bread and cakes GmbH nationally and internationally. Main market is Germany. Exported the whole grain breads to the UK, France, Scandinavia, Austria and the United States of America. The main market is the German and European food trade. 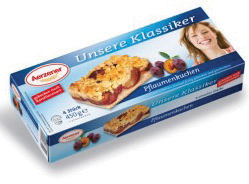 The Aerzen core range is present in hypermarkets / supermarkets, discount stores and supermarkets and neighborhood stores. 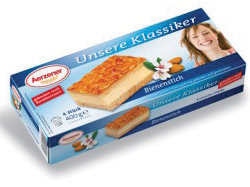 Description: Our delicious almond coated filled yeast cake tastes deliciously ispre-sliced in 4 pieces. The fresh almond pieces are placed on fluffy yeast dough covered by almond slices. Nobody can resist this unique consumption of pie. 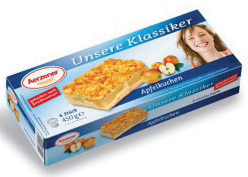 Description: Our delicious apple crumble pie tastes deliciously juicy and is pre-sliced in 4 pieces. The fresh apple pieces are placed on fluffy yeast dough covered by crunchy crumbles. Nobody can resist this unique consumption of pie. 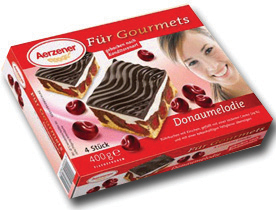 Description: Our Donaumelodie cake is a real classic. A highlight of our master confectioner. Based on a traditional recipe the cake is masterly baked with sour cherries and covered with vanilla cream. With the final chocolate glaze the typical note of this cake arises. An unforgettable experience!